Do you have a minute to spare to learn some English? 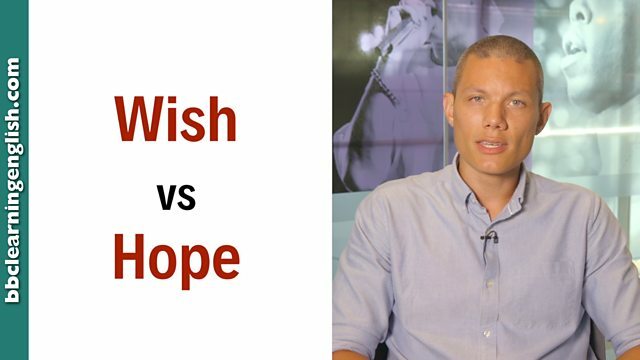 Dan hopes you'll enjoy learning the difference between wish and hope! Give us 60 seconds and we'll give you the English! Hi, guys! Dan for BBC Learning English here. Today, we're going to talk about the verbs wish and hope. Now, the verb wish can be used in many ways – and you can get much more detailed information on our website. However, we generally use wish to talk about a present or past situation that we want to change, but understand that it can't. Present wishes are wish + a past simple verb. For example: I wish I were taller. Past wishes are wish + past perfect. I wish I had grown taller. Hope can also be used in different ways. But generally, when we hope, we talk about something that we want or expect for the future. Hope can be followed by a full infinitive. For example: I hope to see you soon. But more commonly we follow it with a present tense that has a future meaning, or with will. I hope you pass your driving test. I hope you'll have a good time. Wish is commonly used to talk about a present or a past situation. When we use wish, we talk about a situation or action in the present or past that we want to be different, but know that it can't. Wish is a complicated verb with many uses - click image above to learn about some of its other uses. Present wishes are for situations in the present we want to change (but know they can't). We form a present wish with the verb wish + a past simple verb. It is common when using wish, to use the verb 'were' with all pronouns. I wish I was/ were taller. I bet he wishes he knew the answer to the question. They wish they didn't know that the holidays were ending soon. Past wishes are for situations in the past we want to change (but know they can't). We form a past wish with the verb wish + past perfect (the verb 'had' and a past participle verb). I wish I had grown taller. She wishes she hadn't met you. Do you ever wish you had become a musician? We use hope to talk about things we want or expect to happen in the future. Hope can be followed by a full infinitive, a present verb with a future meaning or with 'will' and an infinitive verb. She hopes to study at university next year. I hope you pass your driving test. We hope the weather is pleasant. I hope you'll have a good time. They hope you won't forget them. This video was about wish and hope! What's the difference between them? Which of these is not a correct wish about the past? Hope can be followed by a full infinitive, a present verb with a future meaning or with 'will' and an infinitive verb. Which of these sentences with 'hope' is incorrect?